Visit was great and Dr. Saper is amazing! Very knowledgeable and with excellent bedside manner. Highly recommend him forOrthopedic consultation. Visit was great and Dr. Saper is amazing! Very knowledgeable and with excellent bedside manner. Highly recommend him for Orthopedic consultation. Dr. Saper was great. He really took the time to listen to my issue and admitted when he didn't know somethingwhich I appreciate. He was very honest and made me feel very comfortable! Few doctors are as friendly as him. Dr. Saper was great. He really took the time to listen to my issue and admitted when he didn't know something which I appreciate. He was very honest and made mefeel very comfortable! Few doctors are as friendly as him. Dr. David Saper is on staff as the Co-Director of Orthopaedic Sports Medicine at Orthopaedic and Rehabilitation Centers, Chicago. 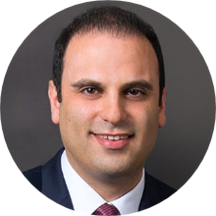 Dr. Saper completed both medical school and a Sports Medicine Fellowship at the prestigious University of Chicago Pritzker School of Medicine and served as an assistant physician for the University of Chicago Maroon’s Athletic Department. He has advanced training in a variety of both non-operative and minimally invasive procedures to treat and repair sports and orthopedic injuries and arthritis of the shoulder, elbow, hip, knee, and ankle. Dr. Saper also has considerable experience with fracture and trauma care and completed his residency training in New England’s busiest Level 1 Trauma Center. He continues to provide trauma and fracture care as a surgeon at two of Chicago’s Level 1 trauma centers. In addition to clinical care, Dr. Saper has presented multiple research presentations at national orthopedic conferences including the ‘Orthopaedic Trauma Association,’ the ‘American Society for Surgery of the Hand,’ and the ‘American Academy of Orthopaedic Surgeons.’ He has published several peer-reviewed research papers, novel surgical techniques, and review articles in the orthopedic literature on the topics of sports and trauma and currently serves as a reviewer for the highest impact orthopedic journal, The American Journal of Sports Medicine. Dr. Saper is dedicated to the complete care of the individual and stays up to date with the latest techniques, technologies, and treatments to treat bone, cartilage, and joint disorders. He aims to collaborate with patients to help restore their mobility so they can reach their maximal potential in sport, work, and life. 2. David Saper MD, Akash Shaw BS, Andrew Stein, MD. “Chiari Malformation Type 1 with Cervicothoracic Syrinx Presenting as Acute Thumb Necrosis: A Case Report.” Injury 45 (2014) 62–64. 3. David Saper MD, Paul Tornetta III MD. “Intraoperative Control of Rotational Forces During Sliding Hip Screw Insertion- A Novel Surgical Technique.” Techniques in Orthopaedics. December 30th 2014. Dr Saper is very knowledgeable with the most current sports med treatments . He also explains them well. Really felt comfortable in office & and with Dr Saper & assistants that were in the room He was very honest and upfront and kind listened to my on going medical issues and was very attentive to my concerns. Today Istarted a journey with Dr Saper as we work together & his team on a plan for better healthly Me. Thank you..
Dr. Saber and his associate were both very friendly and informative. They asked a lot of questions to get to know my history, and provided helpful information for next steps. Dr. Saber provided me with his email to follow up directlywith questions which is something not many doctors have done in my experience. I would highly recommend and will definitely go back if more issues arise! This is my third soccer related injury and the third time I have seen Dr Saper. His staff is fantastic and very accommodating. Dr. Saper is very thorough and diligent when looking at options and not always eager to cut youopen. His education accolades speak for themselves and bedside manner is always on point. I would recommend Dr. Saper to all athletes who never want to stop playing the sports they love. Dr. Saper and his team of residents were outstanding. I had been without health insurance for a while, so I forgot how great it is to see a top of the line doctor. Dr. Saper was extremely knowledgeable about the kneepain I had been experiencing; and he even suspected that I'd have an off reaction anethesia based on me being ginger (I've had doctors look at me like I'm crazy when I bring this up). He and his team of residents took the time to listen to me and I'm really excited to continue my healing journey in his hands. Aside from just being great doctors, bedside manner was excellent; I felt very comfortable. Highly highly recommend this practice. Fast X-rays and Doctor visit. Great experience! Dr Sapor is exceptional ly knowledgeable & highly informed about the latest research as it applies clinically. He is warm, friendly, kind! He’s the best orthopedic surgeon I have met. Dr. Saper was great. Excellent communicator and very down-to-earth to talk to. The only issue I had was that I waited for more than 30 minutes roughly. But this shouldn't be an issue to not go visit this med office. Thanks Dr. Saper! Dr. Saper was professional and showed a great attention to detail. He explained everything concerning my condition very well and left me with a feeling that if I need anything else I am encouraged to contact him. Dr. Super is a great doctor. I consulted him for some pain in my fingers. I appreciated his knowledge and most importantly his willingness to explain to you all potential hypotheses patiently. Doctor Saper is the best! Amazing surgery without complications. Very knowledgeable! Super friendly and great surgeon. On my way to recovery now from an Achilles tear. Highly recommed. Dr. Saper was professional and knowledgeable. He was able to see me as a new patient on short notice. Xrays were taken in the office and there is a parking lot available. Very happy Zocdoc recommended him. The office staff was very friendly and I was seen on time. Dr. Saper was very thorough in his explanation of what is going on with me, even drawing a little diagram of the muscles surrounding my spine to give mea clearer understanding. 10 out of 10; would recommend. The doctor was great! Very informative. The front desk seemed like they were all over the place. Not very organized. I had a wonderful visit with Dr. Saper & his team (Vincent) during my visit earlier today. Dr. Saper & his team have a wonderful bedside manner and helped make me feel at ease in discussing my injury and any concerns I expressed. I highly, highly recommend. Dr. Saper is really friendly, knowledgeable, and I am glad he saw me. His office staff and the billing department are severely lacking, however. I would never recommend his practice to others based on the staff alone. When I was tryingto discuss billing issues where we'd been incorrectly billed, they hung up on us. I went to Dr. Saper to get a second opinion on a labrum tear last October. He spend a long time explaining everything to me and discussing my options. He was very patient and answered all my questions. I can highly recommend him. Only waited about 10 minutes so I got in fairly fast. Did a great job of explaining the surgery and the next steps. Overall had a very positive experience with Dr. Saper. It was my first time seeing him and I found that he was thorough in his exam, explained to me what was causing my issues, answered all my questions about treatment options,and was extremely professional throughout the process. I plan to go back to see him in a few weeks for a follow-up visit. Dr. Saper was excellent. I really liked his bed side manners. He listened to me patiently, walked me through my x-rays and the treatment options. I highly recommend him. My only complaint with the entire appointment was with the staff upfront.They were confused about my insurance for some reason and insisted that I pay the full amount vs. just the co-pay. However, the office manager called up 30 minutes later and refunded the extra amount I paid. So, all was well. He's great! Very thorough and knowledgable! Highly recommended!! I visited Dr. Saper to follow up on an injury I sustained while traveling in Southeast Asia. His team was professional and thorough, and Dr. Saper was able to create a treatment plan quickly and communicate what I needed to dowith exceptional clarity. Plus, he's friendly - which I always find helps me immensely when I'm meeting a doctor for the first time. I came back to Dr. Saper to have my left foot examined after a fall down the stairs. I made this appointment very last minute, and they got me in right away. Everyone in his office is so polite and accommodating,and his bedside manor is simply delightful! I very highly recommend him. Incredibly thoughtful and very aware of individual needs, which vary greatly from any one person. He took his time with me and was not rushed at all. Instead I felt like he provided me with great references and extensive diagnostics that provided clear evidence for reasonable next steps. The DR and his staff were very professional and punctual. Great staff and really honest opinion. Very informative and to the point, good sense of humor and no sugar coating. Would absolutely see him again, and recommend him to others. All the staffers at doctor Saper's office were very helpful and professional. When I showed up they had the zoc-doc forms all ready to go already filled out. The office is like a one stop shop with what seems tobe a great environment with many qualified specialists and support staff. I needed x-rays so they were done right there in the office and instantly available. They were also connected to a physical therapy center so I scheduled some physical therapy right there. After looking at the X-rays, performing some range of motion tests, and the series of questions, Dr. Saper was able to diagnose me. He prescribed some treatments that already seem to be making a difference. Over all it was definitely worth booking an appointment. It was great. I was able to get an appt pretty quick and I enjoyed the process. Everyone was very nice. I was able to schedule with ease, in a very timely appointment, within days of issue. Dr Saper was friendly, knowledgeable, and addressed my issues. I left confident that I am on a path to recovery. Dr. Saper was super straightforward and helpful. He explained exactly what the issues were with my hand injury and laid out a recovery plan. He made me feel completely comfortable and confident that the recovery would go smoothly. I have anotherappt in a couple of weeks and I look forward to seeing him again. Dr. Saper was awesome. I waited a bit in the waiting room but once I was taken into a room he did not make me wait long. He was personable and friendly. He took the time to explain what was goingon with me in very simple language so that I was clearly able to understand. I would definitely recommend him. Was able to fit me in that day. Diagnosed me quickly and got me on my way. A successful appointment. Dr. Saper was very informative. Answered all our questions. I took my 12 year old son. He said he felt very comfortable with Dr. Saper. I highly recommend him. The office was very professional. Dr. Saper needs to move practices. He is a terrific doctor with a great bedside manner he is open to listening to his patients and has their best interests in mind. However the personal that run the practice lack the correctattitude to work in the healthcare industry. I am fully insured with great healthcare, and this practice is a preferred provider. They would not let me leave unless I paid for all services (copay & X-rays) before I left, telling me my insurance covered nothing. Turns out my insurance covered 80% of my visit and I am stilling battling their department. on reimbursement I also requested my medical records, which any patient is legally allowed to do. It took them over the 30 day legal limit to provide these records; even after following through every 3-5 days. Doubling Billing, Attitude & In ability to follow though on communication. There are plenty of other options in the Chicagoland. Do not work with this practice if you have the choice, I leaned my lesson the hard way. I was very nervous about seeing an orthopedic surgeon but am glad I was referred to Dr. Saper. He was very calm and straightforward in explaining the likely prognosis of my injury and in developing a recommended action plan. That provideda lot of peace of mind for me, which I greatly appreciated. The office staff was very friendly and professional, too. I scheduled all follow-up tests and appointments before I left, which also helped with the peace of mind.